The above is from the 1902 Montreal Liquor Industry Gazette. It’s an interesting document, mostly in French, which combines trade ads with articles of interest to the wine, spirits, and tobacco trade especially on taxation and regulatory matters. The full source document can be viewed here. The distillers represented were by 1900 the main distillers in the country. 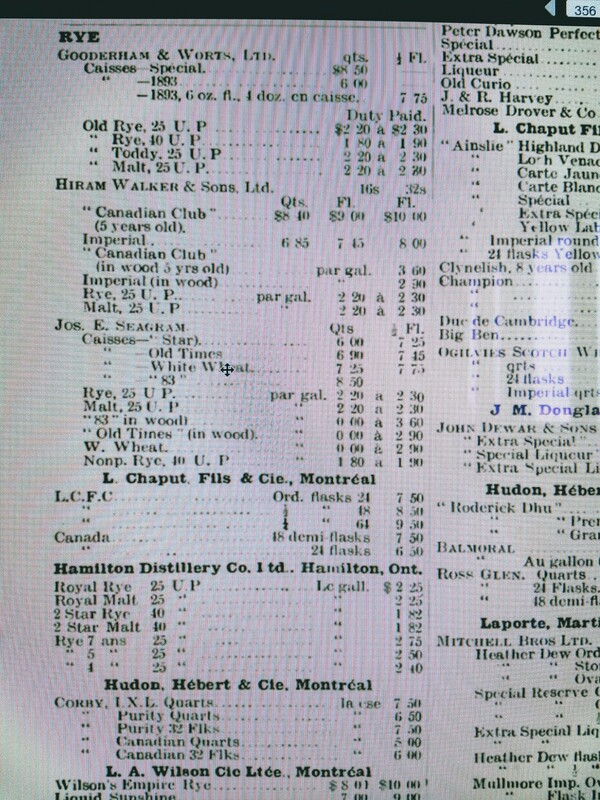 Hudon Hébert were surely a broker or wholesaler, representing Corby distillery of Belleville, ON. L.A. Wilson was Lawrence Wilson, a driving force behind the Montreal Victuallers Association which published the Gazette mentioned. I would guess Empire Rye was sourced by him from one of the extant distillers in Canada, although perhaps he had a small distillery. A William Wilson distilled earlier in the century in Montreal, perhaps Lawrence was a descendant. In one of Jack Sullivan’s articles in his historical whiskey blog he shows a blurry image of a bottle of Empire Rye carried by a New York dealer around the same time, M. Salzman & Co.
I’d think that was Lawrence Wilson’s rye, or his sourced rye, finding a market outside Canada. An additional reason is one of the advertising pieces for Morris Salzman reproduced in the article shows him as an importer of liquors. But what was Hamilton Distillery? Extrapolating from the ad, it sold Canadian whisky aged from 2-7 years. Two years was the minimum aging requirement enacted in 1890. The pricing seems to follow the progression of maturity, but proof differences may be a factor also, e.g. the 25 vs. 40 UP. Hamilton Distillery was more typically called Royal Distillery. It is an outlier in Canadian whisky history as relatively little exists (that I could find) on it. It was a sizeable operation, of which a small portion, a low-rise brick building, still stands at 16 Jarvis Street in Hamilton. Royal Distillery was founded by a teacher, industrialist, and sometime mayor of Hamilton, Benjamin Ernest Charlton, in 1888. From a standing start it grew to rival the Big 5 distillers in Ontario, all of whom are represented above except Wiser, unless Wiser was supplying Wilson or Chaput. 1888 was late to start a distillery in Canada especially of the scale of Royal Distillery. I’ll have more to say soon on this little-known aspect of our whisky heritage. Looking at Seagram quickly, three types are represented, a malt, a rye, and a white wheat whiskey, the latter probably was near to modern vodka. The rye was represented in different ages based on the prices shown, and perhaps different blending formulations. Its heritage is extremely interesting as one of the owners before Joseph Seagram, long-lived, multi-talented William Hespeler, had a German background. See this illuminating Dictionary of Canadian Biography entry on him. The Canadian Encyclopedia profile on Seagram states Seagram rye was originally called Alte Kornschnapps. That term might have been simply a translation of old rye for the local market in Waterloo, ON and environs, an area dominated by the Pennsylvania Dutch, who arrived after the American Revolution, and other German-speakers, who arrived in their wake from Europe. Or, perhaps Hespeler’s korn originated, as Pennsylvania rye whiskey may have, strictly with a German Rhineland and Palatinate distilling tradition brought to America. Corby’s top of the line was I.X.L – I excel – probably aged circa 7 years. Hiram Walker’s famed Canadian Club was 5 years old in this period. The age moved around somewhat, between 5 and 7 from my reading. To this day I prefer that particular brand at the top end of its range, 6 years old is ideal and the current bottlings seem somewhat younger. I should try it again. Batches vary, bottlings vary – indeed of all whiskeys and in brewing too – it makes learning about it all the more interesting. When you get a particularly good one, you know. That happened recently with a bottle of Woodford Reserve straight bourbon. It was richer and much less congeneric than in the years after first release. I recently bought a Canadian Club Chairman’s Select 100% Rye that is particularly rich and brandy-like.